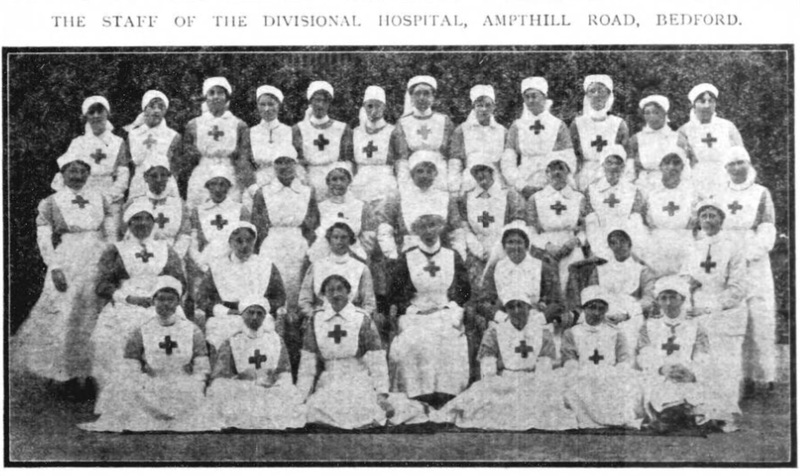 The Bedfordshire Times and Independent of 19 January 1917 included a photograph of staff at and details of the VAD hospital in Ampthill Road. The paper reported that the hospital, which had then been running for one year and ten months, was worked by Voluntary Aid Detachment No 6 Bedfordshire, who were then augmented by members of VAD No 2 Bedfordshire and a few members from other detachments in the County, in conjunction with the RAMC. With four exceptions all the members were from Bedford or the county. The hospital consisted of 11 wards, four revolving shelters, and an open air pavilion, 112 beds in all: also it had a well equipped operating theatre, and an out-patients department dealing with a large number of patients daily in connection with it. Mrs Thomson (seated in the centre), Matron and Commandant of VAD No 6 which was formed in 1911, had personally trained her Detachment from the beginning and entirely organised and equipped the hospital throughout. On the military side the staff consisted of six medical officers, and roughly 50 NCOs and men, under the command of Lieutenant-Colonel O I Rhys, RAMC. Corporal the Reverend Daniel Hughes, of the Royal Army Medical Corps, Baptist minister at Pontypool, was according to the Free Press of Monmouthshire of 18 February 1916 for some time in charge of the operating ward at Ampthill Hospital, Bedford (presumably the divisional hospital in Ampthill Road schools). He had preached the anniversary sermons at the Central Primitive Methodist Church, Bedford, in February 1916; and was literary adjudicator at the Easter Monday Eisteddfod at Bedford in April 1916 and as deputy Arch Druid of the Isles of Britain, acted as Master of Ceremonies in the chairing of the bard. Sister Butterworth, Assistant Matron at the hospital, carried the laurel chaplet in the procession to the platform for the chairing of the bard at the Easter Monday Eisteddfod, and crowned the chaired bard with the chaplet during the chairing ceremony. The chaired bard, Private the Reverend Alfred Jenkins BA, was also of the Royal Army Medical Corps. The Bedfordshire Times and Independent of 13 August 1915 quoted the Welsh RAMC Gazette which commented that since arriving in Bedford, the 1/3rd WFA had done some good work. They had very successfully run the Ampthill Road Hospital for a month, and their stay had not been marred by any of the usual happenings during hospital duty. On handing over the hospital the Corps started some field work, having two field days a week, each of about 12 hours duration. On those field days the Transport Section had excelled in their work, and transported the sick very quickly; they were also to be congratulated on the way in which they disguised their ambulance wagons as trees. 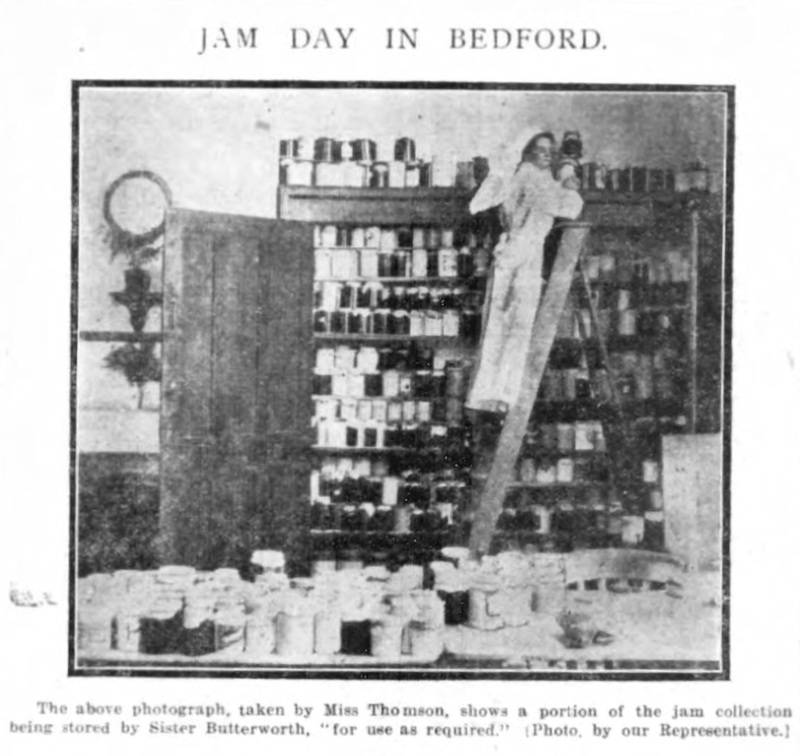 The paper gave further details of how and from where the jam was collected for Jam Day.